I'm going to write a long but detailrd description to fill in all the details. 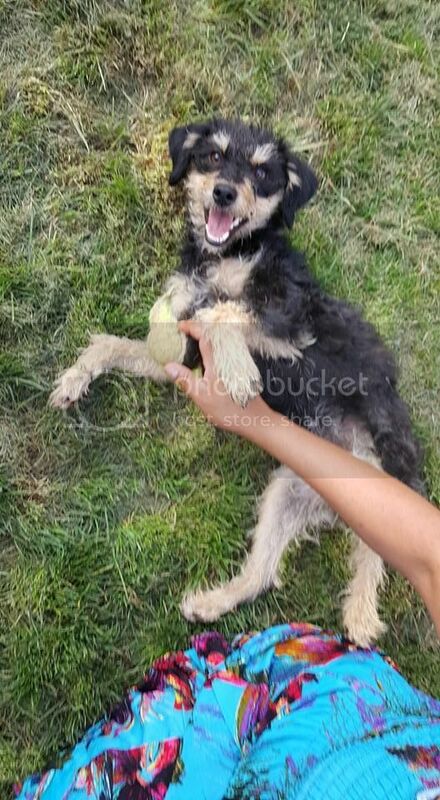 When I was living in Chile we adopted a fair few animals and I think this drew some attention from the neighbours, as one day we opened the front door to find this small dog with an injured leg, we obviously felt we should help how we can, so were nursed it back, vet check up, newtered and vaccinated her. We named her Tin Tin. Once she was better we went on to find someone to adopt, wasn't easy but we found someone and things seemed fine and then later in the year we left with our 4 dogs and 2 cats. We recently heard the lady who adopted them could not keep Tin Tin, and palmed her ff temporarily om a neighbour, reason we were given was that she was too busy with work and could not give her time. Sounded weak and heartless. So whilst my wife was back in Chile seeing parents she did some investigating and the ladies Brother who we know, and is generally always been a good egg, told us that the ladies boyfriend has been hitting and throwing against the wall Tin Tin. Terrible especially for a small dog. Tin Tin never causes any problems. Never aggressive. Brilliant with children. Toilet trained. My wife took her to a vet and got her vaccines renewed whilst visiting. It is impossible we can take another dog to the UK. We are desperate to find a person to adopt. You work long hours, not a problem, as long as your loving and responsible that is better for Tin Tin, who currently is between the streets and violence. Even a dog home who would take her in, we woild donate some money to pay for her food for example. She is a wonderful dog, family friendly and so happy. Please help before this changes. Thank you for taking your time to read this. Pass on the information if you can. 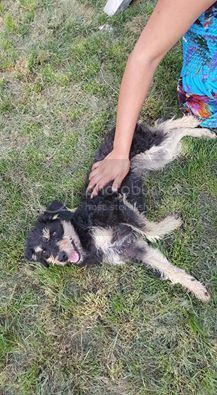 Re: Dog in danger, needs adopting. Mate I can't take her but I copied your post to a f/book group. Hopefully someone can help her. yea, I got three dogs right now, plus a neighbor dog I am watching while the owners are out of town. As I was trying to handle 4 dogs the other day, I realized three was my limit. but, ... I'll keep an eye out for a friend that could really use a dog (even if they don't know it yet). admin wrote: yea, I got three dogs right now, plus a neighbor dog I am watching while the owners are out of town. As I was trying to handle 4 dogs the other day, I realized three was my limit. (even if they don't know it yet). Ha,ha,haa nice chap you are! I love anyone that cares for Dogs and Cats even for Horse and Chickens too ! I read a great quote recently in a book about a dog in a WWII POW camp. One of the better dog stories I have ever read. Something like, "the only sign of lack of intelligence in dogs I have ever seen, is how quickly they forgive us humans". well, the last stray dog I found a home for, it was a year before I told the new owner how the dog came to be with them. Friends of mine has a french restaurant in town, but no dogs. One afternoon I was sitting out on their deck alone having a drink. They always bring some appetizer to the table. Think it was duck or something. This really friendly brown doberman pincher puppy comes wondering up. I know once you feed a stray dog, it's pretty much yours. I thought about it, and decided they could use a dog. So I slipped him the treat. Then some other friends showed up, and they slipped him some more treats. Guess the dog decided if your going to be homeless, you should be homeless at the best restaurant in town. That dog now spends 6 months a year in France, and 6 months a year in Frutillar. My first Chilean street dog was due to some friends that ambushed me with this stray puppy they found. I refused to go see it. They then tricked me in to going to a party, where they shoved this black puppy in my arms as I came through the door. They new once I picked it up, it was going to die in my arms someday. That dog is sleeping at the end of my bed right now. Dosedmonkey, I have aomeone interested but need to know if Tin Tin is ok with cats? Sorry for slow reply. Had been off the forums. Looking on facebook and busy with things. Cant believe I missed this. Cheers. Will check back tomorrow. Sent you a PM.